The holiday deals you see advertised by auto dealerships, they are not just hype. When it comes to shopping for a new car, truck or SUV, December is the month you want to do it. You will be hard-pressed to get a better deal any other time of the year. So while you are out cruising the malls and retail stores, take the time to pull into your local dealership, it’s a move that is sure to pay off. 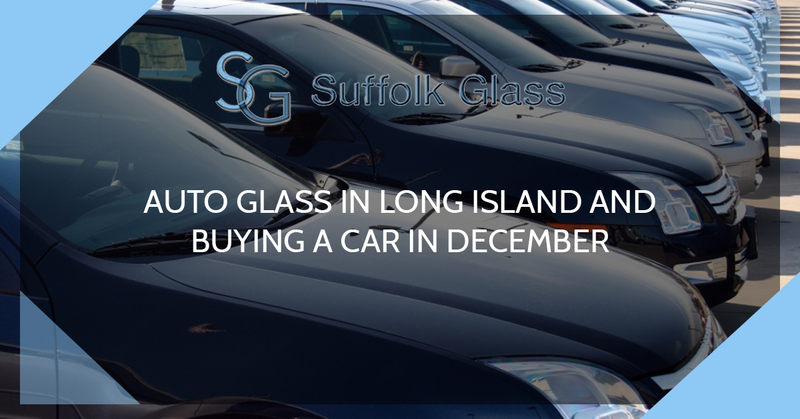 Suffolk Glass, your auto glass service in Long Island, offers you the reasons to buy a new vehicle in December. Like home sales, vehicle sales are much better in the spring, summer and fall, when the weather is nicer and brings people outside and eager to shop. Nobody wants to stand outside a dealership looking at cars in the middle of winter, we would rather be in our warm houses in front of our big-screen televisions. This means less foot traffic at the dealerships and a desperate sales staff. This puts you, the buyer, in the driver’s seat in terms of leverage and the price you are willing to pay for your new car. October is the month new models make their way to the dealerships. So come December, new models are sitting next to old models that need to go right away. This glut of inventory results in a sales staff pressured to sell and a great deal for you. After Christmas, people are broke, the weather isn’t any nicer and credit card bills start to come in. January and February are the darkest months for auto sales, so dealerships know they need to capitalize on sales in December. Their hopes are to pump up December sales to carry them through the lean months of January and February. There are models that manufacturers have stopped making. As soon as there is an announcement of a discontinuation, usually made over the holiday season, car dealers drive those cars to the front of their lots and slap big reduction stickers on them. The market for discontinued models dries up quickly, so they need to strike right away. Once a model is discontinued, there are far fewer incentives to buy it, which forces the need to drive the price way down. For the first 11 months of the year, car dealerships only compete with other car dealerships. Come December, however, car dealerships are in competition with Target, JCPenny, Amazon and all of the other retail outlets for your hard-earned cash. Home Depot just marked down that snowblower that will make your life a lot easier and Best Buy is having a killer sale on big screen televisions so dealerships need to drastically drop prices to lure you in. The sales staff at dealerships work largely on commission, the more cars they sell, the more money they make. There is also an added incentive in the form of a bonus for selling cars over the course of the year. This means sales staff are more likely to agree to your terms so they can get their bonus. And when your new car needs windshield repair, call Suffolk Glass.